Every weekend, we think about where to take Bubbles, just so she has new experiences. She is always enjoys these outings. 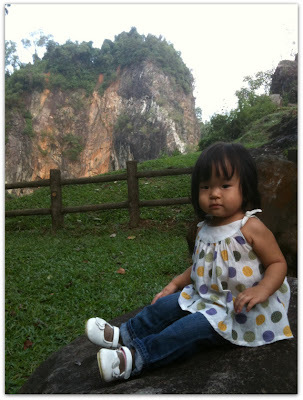 Recently, we took her on a whim to Little Guilin. We weren't dressed for it at all, as you can see from Bubbles' "going to the mall" outfit. The weather was beautiful that day, and we enjoyed the cool breeze that blew over the pond. There is a little secluded area where you could sit on large rocks at the edge of the pond to admire the view. We were there for a while watching some little boys attempt to catch tadpoles. Birds were chirping and there was a quietness that was refreshing. All of a sudden, loud music penetrated the air. An indistinguishable pop song played from a small radio brought in by a couple. They were completely oblivious to the peaceful sounds of nature that they had just drowned out. We left soon after but not before taking a holiday-worthy shot of Bubbles. so cute! she looks all grown up here! Hey, never call me. 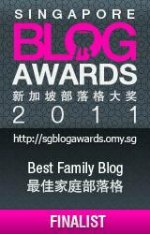 My blk is nearby, can join bubble for photo taking hehe!